James Elmer Mitchell (born 1952) is a psychologist and former member of the United States Air Force. From 2002, after his retirement from the military, to 2009 his company Mitchell Jessen and Associates received $81 million on contract from the CIA to carry out debriefings of detainees and to develop and conduct enhanced interrogation techniques. Mitchell joined the Air Force in 1975 and was first stationed in Alaska, learning to disarm unexploded ordnance. He was also a hostage negotiator at Lackland Air Force Base in Texas. He left the military in the early 1980s to earn a master's degree in psychology at the University of Alaska. He then received a Ph.D. in psychology at the University of South Florida in 1986. His thesis compared diet and exercise in controlling hypertension. Mitchell returned to the Air Force and in 1988 became the chief of psychology at the Air Force survival school at Fairchild Air Force Base in Spokane, Washington. He succeeded Bruce Jessen, who had moved to an advanced school of survival training at the base. Mitchell supervised the trainers who role-played as enemy interrogators for military personnel going through Survival, Evasion, Resistance and Escape (SERE) training. In 1996, Mitchell was the psychologist for a unit in the Air Force Special Operations Command at Fort Bragg, North Carolina. He retired as a Lieutenant Colonel in mid 2001. After the September 11 attacks, Mitchell was asked by CIA to develop an interrogation program based on what were believed to be al-Qaeda documents on resisting interrogation. (p193) Mitchell and Jessen recommended use of SERE counter-interrogation training, reverse-engineered to obtain intelligence from captives. (p195) Mitchell was later reported to have personally waterboarded Khalid Sheikh Mohammed. In 2005, Mitchell and Bruce Jessen formed a company called Mitchell Jessen and Associates, with offices in Spokane and Virginia and five additional associates, four of them from military SERE programs. By 2007, the company employed around 60 people, including former CIA interrogator Deuce Martinez; Karen Gardner, a former senior training official at the FBI Academy, and Roger Aldrich, a "legendary" military survival trainer. In April 2009, the CIA canceled the contract with Mitchell and Jessen's company, after having paid $81 million out of the authorized $180 million. The CIA Inspector General concluded that there was no scientific reason to believe that the program Mitchell designed was medically safe or would produce reliable information. The CIA agreed as part of the contract to provide legal costs for Mitchell and Jessen of at least $5 million if necessary. Mitchell's identity in the interview program was made public by Vanity Fair in 2007 and further analyzed by The New York Times in 2009. In a 2014 interview with The Guardian, Mitchell defended the program and his role, but said that his ability to defend himself was curtailed as he could not speak on specifics due to a signed non-disclosure agreement with the government. In the 2016 book Enhanced Interrogation (written with co-author Bill Harlow), Mitchell provides more details and background information on the interrogation program. In 2015, the National Security Advisor Susan Rice asked the CIA to assess the efficacy of enhanced interrogation techniques (EITs). The CIA compiled a summary of key intelligence collected after the application of (unspecified) interrogation techniques. The memorandum lists intelligence related to the following topics: The Karachi Plot, The Heathrow Plot, The "Second Wave," The Guraba Cell, Issa al-Hindi, Abu Talha al-Pakistani, Hambali's Capture, Jafaar al-Tayyar, Dirty Bomb Plot, Shoe bomber, and Sh(a)kai (Pakistan). The CIA believes that the intelligence acquired from the interrogations cited in the summary was a key reason Al-Queda was unable to launch a spectacular attack against western targets after 9/11. The US Senate Report on CIA Detention Interrogation Program that details the use of torture during CIA detention and interrogation. 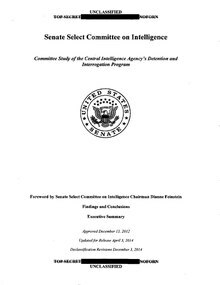 On December 9, 2014 the United States Senate Select Committee on Intelligence released a report confirming the use of torture and SERE tactics in interrogations. The contractors that developed the "enhanced interrogation techniques" received US$81 million for their services, out of a contract with a potential value in excess of US$180 million. NBC News identified the contractors, who were referred to in the report via pseudonyms, as Mitchell, Jessen & Associates from Spokane, Washington, a company run by two psychologists, John "Bruce" Jessen and James Mitchell. Jessen had been a senior psychologist at the Defense Department where he taught special forces how to resist and endure torture. The Intelligence Committee report states that the contractor "developed the list of enhanced interrogation techniques and personally conducted interrogations of some of the CIA's most significant detainees using those techniques. The contractors also evaluated whether the detainees' psychological state allowed for continued use of the techniques, even for some detainees they themselves were interrogating or had interrogated." Mitchell, Jessen & Associates developed a "menu" of 20 enhanced techniques including waterboarding, sleep deprivation and stress positions. The CIA acting general counsel, described in his book Company Man, that the enhanced techniques were "sadistic and terrifying." The report said Mitchell "had reviewed research on learned helplessness, in which individuals might become passive and depressed in response to adverse or uncontrollable events. He theorized that inducing such a state could encourage a detainee to cooperate and provide information." When contacted about his role in the controversial program in the aftermath of its publishing, he confirmed that he signed a non-disclosure agreement with the government, not enabling him to confirm or deny his involvement. "[E]veryone is assuming it is me, but I can’t confirm or deny it. It is frustrating because you can’t defend yourself." In 2010, psychologist Jim L. H. Cox filed a formal ethics complaint against Mitchell in Texas, where Mitchell was a licensed psychologist, alleging that he had violated the profession's rules of practice by helping the CIA develop "enhanced interrogation [i.e., torture] techniques." Although Mitchell was not a member, the American Psychological Association sent a letter to the Texas State Board of Examiners of Psychologists stating that the actions alleged by the complainant to have been committed by Mitchell were "patently unethical," and that longstanding APA policy strictly prohibited psychologists from being involved "in any form of torture or other types of cruel, degrading or inhuman treatment or punishment." The APA justified its intervention by stating that "the allegations put forward in the complaint and those that are on the public record about Dr. Mitchell are simply so serious, and if true, such a gross violation of his professional ethics, that we felt it necessary to act." When asked about the allegations, Mitchell called the complaint libelous and "riddled throughout with fabricated details, lies, distortions and inaccuracies." The Board dismissed the complaint against Mitchell on February 10, 2011, saying there wasn't enough evidence to prove Mitchell violated its rules. In 2014, The New York Times Editorial board called for the investigation and prosecution of Mitchell and Jessen for their role in developing the torture practices used by the CIA. In 2015, Human Rights Watch called for the prosecution of Jessen "for [his] alleged direct participation in torture, often applied in ways beyond how it was authorized, but also for [his] role in the initial conspiracy to torture as well." On October 13, 2015 the American Civil Liberties Union filed a lawsuit against James Mitchell and Bruce Jessen on behalf of Mohamed Ahmed Ben Soud, Suleiman Abdullah Salim, and the estate of Gul Rahman, three former detainees who were subjected to the interrogation methods they designed. The suit alleges that the defendants' conduct constituted torture and cruel, inhuman, and degrading treatment; non-consensual human experimentation; and war crimes—"all of which are violations of 'specific, universal, and obligatory' international law norms, as evidenced by numerous binding international treaties, declarations, and other international law instruments." A trial was set for June 2017. On July 28, 2017, U.S. District Judge Justin Lowe Quackenbush denied both parties motions for summary judgment, noted that the defendants are indemnified by the United States government, and encouraged the attorneys to reach a settlement before trial. The lawsuit settled in August 2017. Mitchell, who is retired and lives in Land O' Lakes, Florida, spends his free time kayaking, rafting and climbing. He describes himself as an atheist and a supporter of Amnesty International. ^ a b Mitchell, James E.; Harlow, Bill (2016). Enhanced Interrogation. The Crown Publishing Group. ISBN 978-1101906842. ^ a b c Altman, Howard (April 22, 2014). "Pasco man, behind CIA interrogation program, defends actions". Tampa Tribune. Retrieved August 27, 2014. ^ a b c d Scott Shane (August 11, 2009). "Interrogation Inc.: 2 U.S. Architects of Harsh Tactics in 9/11's Wake". The New York Times. They found an excellent customer in the Central Intelligence Agency, where in 2002 they became the architects of the most important interrogation program in the history of American counterterrorism. ^ a b Eichenwald, Kurt (2012). 500 Days: Secrets and Lies in the Terror Wars. Simon & Schuster. ^ Leopold, Jason (April 18, 2014). "CIA torture architect breaks silence to defend 'enhanced interrogation'". Guardian. Retrieved August 26, 2014. ^ a b Windrem, Robert (December 9, 2014). "CIA Paid Torture Teachers More Than $80 Million". NBC News. Archived from the original on December 9, 2014. ^ Central Intelligence Agency Office of Inspector General (May 7, 2004). "Counterterrorism Detention and Interrogation Activities (September 2001 - October 2003)" (PDF). Retrieved August 26, 2014. ^ "AP: CIA Granted Waterboarders $5M Legal Shield". CBS News. Associated Press. December 17, 2010. Retrieved December 10, 2014. ^ Katherine Eban (July 17, 2007). "Rorschach and Awe". Vanity Fair. Retrieved December 10, 2014. ^ a b Leopold, Jason (April 18, 2014). "James Mitchell: 'I'm just a guy who got asked to do something for his country'". Guardian. Retrieved August 20, 2014. ^ "Effectiveness of the CIA counterterrorist interrogation techniques". CIA. 13 June 2016. ^ United States Senate Select Committee on Intelligence. "The Senate Committee’s Report on the C.I.A.’s Use of Torture" December 9, 2014. ^ "Response to the SSCI Study on the Former Detention and Interrogation Program" (PDF). CIA. 27 June 2013. ^ Dilanian, Ken (December 10, 2014). "Psychologist Defends Harsh CIA Interrogations". Huffington Post. Associated Press. Retrieved December 16, 2014. ^ a b Pettypiece, Shannon (December 9, 2014). "Psychologist Linked to CIA Torture: 'I'm Caught in Some Kafka Novel'". Bloomberg. Retrieved December 16, 2014. ^ Smith, Morgan (November 11, 2010). "Psychologist in Terror War Is Subject of Complaint". The New York Times. Texas Tribune. Retrieved August 27, 2014. ^ Goodheart, Carol D. (June 30, 2010). "RE: Complaint filed by Dr. Jim L. H. Cox regarding Dr. James Elmer Mitchell" (PDF). American Psychological Association. Retrieved August 27, 2014. ^ Welsh-Huggins, Andrew (July 10, 2010). "APA Wants James Mitchell, Psychologist Who Helped CIA Torture, Stripped Of His License". Huffington Post. Associated Press. Retrieved August 26, 2014. ^ Robbins, Danny (February 25, 2011). "Texas board won't discipline CIA psychologist". Victoria Advocate. Association Press. Retrieved August 26, 2014. ^ "Prosecute Torturers and Their Bosses". The New York Times. 2014-12-21. Retrieved 2015-04-17. ^ "No More Excuses: A Roadmap to Justice for CIA Torture". hrw.org. Human Rights Watch. Retrieved 2015-12-02. ^ McLaughlin, Jenna (October 13, 2015). "Former U.S. Detainees Sue Psychologists Responsible For CIA Torture Program". Intercept. Retrieved March 30, 2016. ^ "Salim v. Mitchell - Complaint". October 15, 2015. ^ Nicholas Geranios (January 20, 2017). "Judge hints at trial for harsh interrogation suit". The Register-Guard. Associated Press. Retrieved January 20, 2017. ^ Fink, Sheri (29 July 2017). "2 Psychologists in C.I.A. Interrogations Can Face Trial, Judge Rules". The New York Times. p. A18. Retrieved 29 July 2017. Larry Siems: Inside the CIA’s black site torture room Guardian, 9 October 2017. Larsen, Kaj (December 10, 2014). "VICE News Exclusive: The Architect of the CIA's Enhanced Interrogation Program" (Video). YouTube. Retrieved December 10, 2014. Siems, Larry (2012). "The Torture Report". ACLU. Retrieved August 26, 2014. Worthington, Andy (June 24, 2010). "Abu Zubaydah and the Case Against Torture Architect James Mitchell". AndyWorthington.co.uk. Retrieved August 26, 2014. Jim L. H. Cox, PhD. (June 16, 2010). "Complaint: Dr. James Elmer Mitchell (License No. 23564)" (PDF). Retrieved August 27, 2010. Ross, Brian; Cole, Matthew; Rhee, Joseph (April 30, 2009). "Waterboarding, Interrogations: The CIA's $1,000 a Day Specialists". ABC News. Retrieved August 26, 2014. United States Senate Committee on Armed Services (November 20, 2008). "Inquiry into the Treatment of Detainees in U.S. Custody" (PDF). Retrieved August 26, 2014.
International Committee of the Red Cross (February 2007). "ICRC Report on the Treatment of Fourteen 'High Value Detainees' in CIA Custody" (PDF). New York Review of Books. Retrieved August 27, 2014. Central Intelligence Agency Office of Inspector General (May 7, 2004). "Counterterrorism Detention and Interrogation Activities (September 2001 - October 2003)" (PDF). Retrieved August 26, 2014. "James Mitchell - VICE News". This page was last edited on 6 February 2019, at 17:25 (UTC).